Achievements in World of Warcraft are both a record of your accomplishments and a way to look forward to memorable moments that await you. 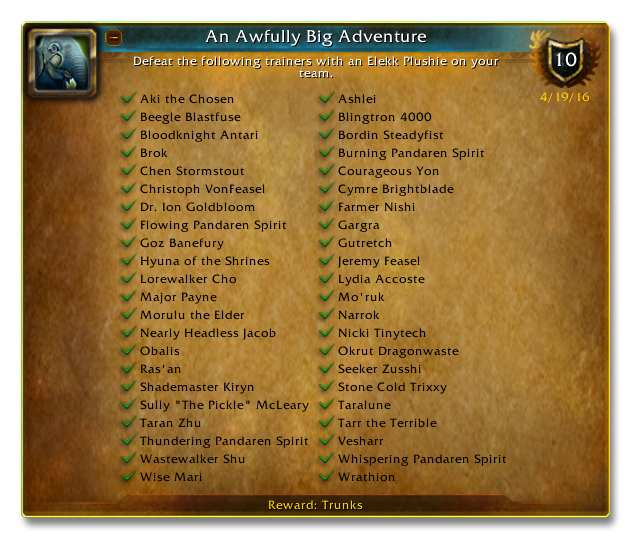 Every Achievement tells a part of your story, and a few come with rewards such as pets, titles, and even mounts. You can see why so many people love to go Achievement hunting. 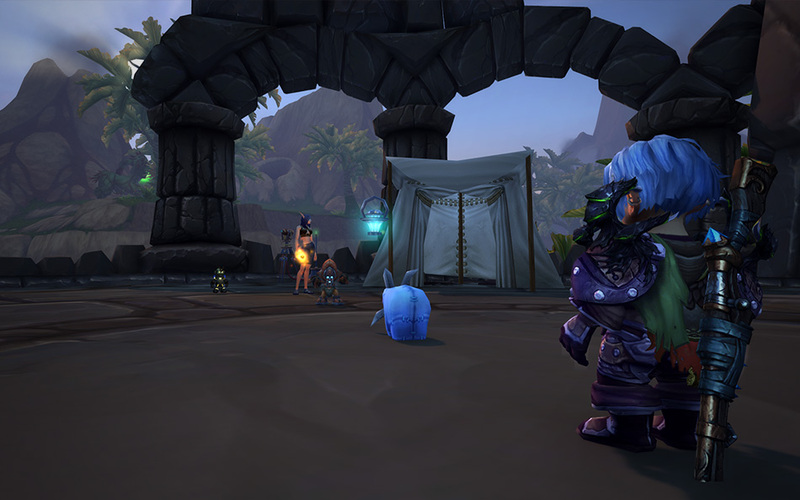 There are many Achievements to be gotten via pet battling, and a few of them may seem very difficult at first glance. This is because progress in pet battling takes the most effort when you're first getting started with it. If you are, don’t despair! As you capture and level up more and more pets, it becomes easier to make progress. Wowhead has a good guide to building up your army of battle pets. Once you’ve reached the point that you have a good stable of level 25 pets, you’ll want to complete the following challenges. The first step from proficiency toward greatness in pet battling is here. Take on and defeat these specific challengers -- spread out all over Pandaria -- by any means you can. You can use any combination of three pets against any one of them. Opinions differ on which is the easiest and which is the hardest, but all seasoned pet battlers agree on one thing: the key to success is aligning your pet's strengths with each opponent's weaknesses. That means, for example, that you want to take down Mo'ruk's flying pet Lightstalker with a dragonkin of your own, since his flying abilities are weak versus dragonkin. As always, Wowhead has a guide that should help you round our your team. Why settle for only one continent when all of Azeroth is waiting to be tamed? 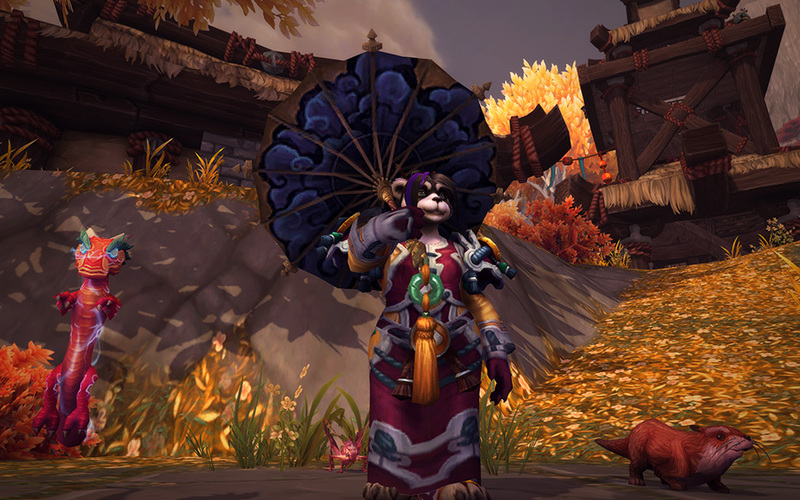 Once you've completed your initial pet battle quests and the Taming Pandaria Achievement, you should be at least half-way to taking down the 40 masters that you need to earn this one. For pet battlers, this Achievement rewards the highly-coveted Safari Hat -- a toy that boosts your pets xp gains when they survive a victory. It's worth tracking down 40 different masters and defeating them for the hat; just don't forget to wear it from now on! It's a wonder to behold, and it's designed to be challenging, but it's not impossible! You can do this. The key to defeating the more difficult of the trainers with a team of only two effective pets is: practice! Chellenge each trainer to a fight and then learn what they do and when they do it. Pick your two effective pets as precisely as possible to counter them. If you simply cannot get past some of them, Albinoette has a truly comprehensive guide to the entire affair on Wowhead. An Awfully Big Adventure is more than a series of pet battle challenges, it's a special tale, and it ultimately rewards you with Trunks -- a battle pet that has actual powers. It's as though you took your Elekk Plushie on the greatest trip a stuffed animal could ever experience, and through great struggle together, you made him real.